Bi-Polar tape is the same quality as our traditional tape. It has the same number of stainless steel wires but they are concentrated at the edge of the tape next to the bumpers instead of distributed evenly as in our traditional tape. 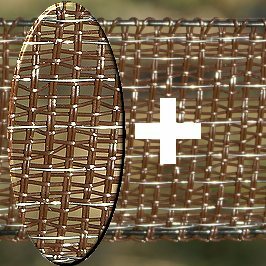 With bi-polar fence tape because the positive and negative are on the same tape the fence will work whatever the ground conditions are - no ground rod required. Please consult us regarding the best energiser to use with a StockGuard bi-polar fence system as not all energisers are suitable. The wires must be connected together at each stainless buckle in order to operate with the same voltage. The permanent contact of the five wires at each edge of the Bi-Polar tape avoids arcing and cuts. All our insulators and colour configurations can be used with bi-polar fencing. The bi-polar tensioner, BP32-3, should be installed on gate posts and corner posts. The BP32-3 can be attached to wooden posts with two long screws. The three-way connection with the BP32-3 is easy to achieve by running the tape at 90 degrees through one side of the buckle and starting the next tape run on the other buckle. 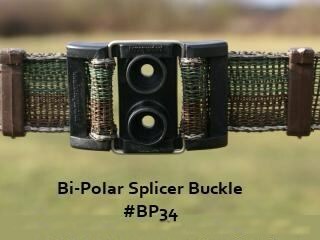 The bi-polar splicer buckle is used to join two ends of bi-polar tape together. 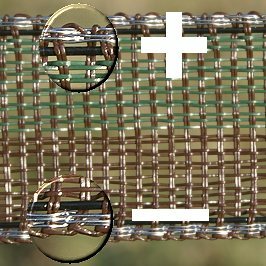 The positive and negative edges of the tape are not in contact. Bi-Polar gate handle for 4cm tape into pig screw insulator on post.